Take me to the Recipe! 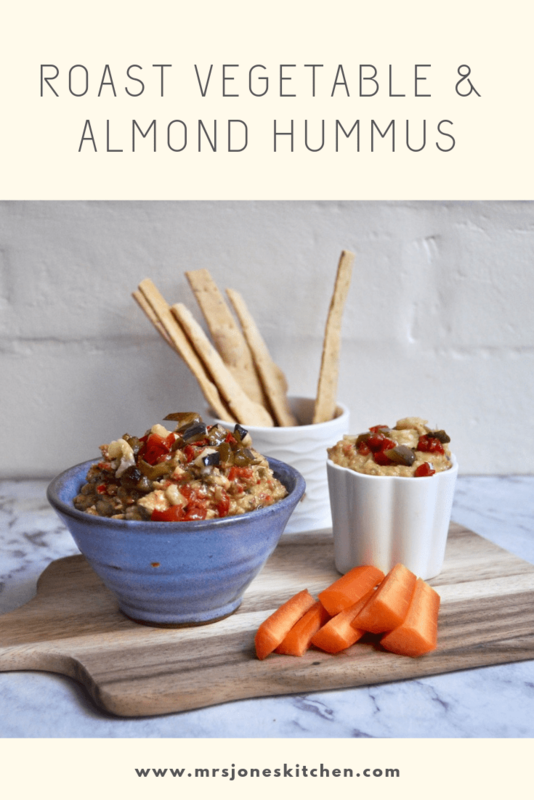 This roast vegetable and almond hummus can easily be made nut free by simply omitting the almonds. If giving this to a child under 5 years of age, make sure there are no large lumps of nut in the hummus as they could pose a choking risk. I like to make a batch without the almonds, then take a couple of spoonfuls out for Mini Jones and blend the almonds with the rest of the hummus for Mr Jones and I. Have you made this recipe? Tag me on Instagram #atmrsjoneskitchen or Facebook, or leave a comment below. I’d love to see your creation! Place the zucchini, capsicums, and garlic in an even layer on a roasting tray. Drizzle with the olive oil then toss with your hands to coat. Roast for 20-30 minutes, until soft. If using, sprinkle over the almonds then place back in the oven for 5 minutes, until the almonds are toasted and fragrant. Cool. 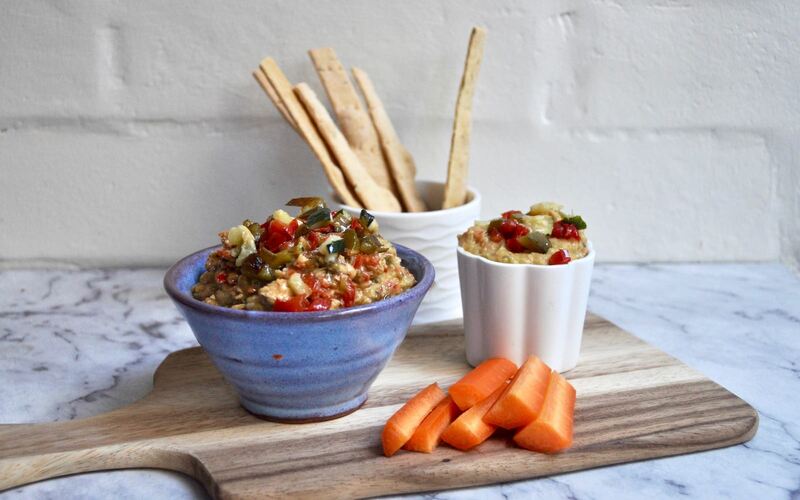 In a blender, squeeze out the garlic from the skins and add the roasted vegetables, nuts, chickpeas, tahini, olive oil, smoked paprika, and blend until your desired consistency – I like mine slightly chunky. Add a little more olive oil if its too thick. Will keep in fridge for a couple of days. I like to blend 2/3 of the roasted vegetables, then finely/roughly chop the rest of them and sprinkle over the top, both for colour and texture, but this is not essential - especially if time is limited or you have a toddler clinging to your legs! If you like my recipes and want to share – thats wonderful – please credit Mrs Jones’s Kitchen and add a link to my website.